Two points separate the Montreal Canadiens from the second-place Ottawa Senators in the Northeast Division, and with 11 games left in the regular season, the teams' three remaining meetings will play a major role in deciding the division champion. Considering the recent history of their rivalry, that could be bad news for Montreal. The Senators look to pull into a tie atop the Northeast on Thursday when they travel to the Bell Centre seeking their eighth win in nine games against the Canadiens. Montreal (39-23-9) has won six of its last eight and is in excellent position to capture its first division title since 1991-92. The Canadiens, though, will likely have to play better against Ottawa (39-25-7) to win the Northeast, having been outscored 34-17 in losing seven of the last eight matchups. They've dropped four of five against the Senators this season, and the most recent meeting was Montreal's worst loss yet. Jason Spezza notched his first career hat trick in Ottawa's 6-1 win Feb. 9. Spezza assisted on the Senators' other three goals in that game, and linemates Daniel Alfredsson (2 goals, 3 assists) and Dany Heatley (1 goal, 3 assists) accounted for 15 of the team's 17 points. "I think that line has killed us every time that we've played them," said Canadiens center Bryan Smolinski, who played parts of three seasons in Ottawa. "They're an unbelievable trio." 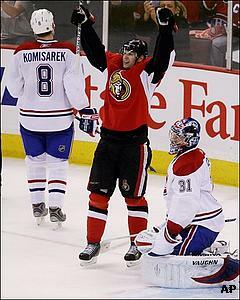 Spezza, Alfredsson and Heatley have combined for 12 goals and 33 points against Montreal this season. The Canadiens, though, will get a bit of a break Thursday, as Alfredsson will miss his fifth straight game with back spasms. Ottawa's captain, however, wasn't needed on the top line Tuesday, as Heatley delivered his seventh career hat trick in a 4-1 victory over Boston. Heatley, who leads Ottawa with 35 goals, has four in his last two games after scoring only three in his previous 13. "When you get into a slump, sometimes offensively you try and do too much and not shoot the puck," Heatley said. "I think we've all been guilty of that and the last two nights we've just tried to make the game simpler." Martin Gerber will start in goal for Ottawa on Thursday. He's 7-2-0 with a 2.46 goals-against average against the Canadiens. Montreal and Ottawa are the two highest-scoring teams in the NHL with 227 goals apiece, but only the Senators have played like one in their head-to-head matchups, outscoring the Canadiens 20-11 this season. Alexei Kovalev leads Montreal with 30 goals, but he has just one in his last 10 games against Ottawa. Offense, however, hasn't been a problem as the Canadiens have gone 6-2 in their last eight. Montreal scored at least four goals in five of those victories. Saku Koivu has three goals in his last four games, including one Tuesday in a 4-0 win over New Jersey. The victory moved Montreal a point ahead of the Devils for the top spot in the Eastern Conference. "That was really important, shutouts aside," said rookie goaltender Carey Price, who picked up his second shutout. "We definitely needed the two points and we're happy to be in first place but we know it's going to be up and down for the rest of the year and we're going to be fighting really hard for first place every time we step on the ice." Price, now Montreal's No. 1 goalie after Cristobal Huet was dealt to Washington at the trade deadline, lost his lone start to Ottawa and gave up three goals when Huet was pulled Feb. 9. In his last seven starts, however, Price is 5-2-0 with a 2.15 GAA.